Happy New Year to all our fishing friends! It’s been a great fishing year, and although the scallop season was down a bit this year, the fishing was fantastic. We’ve expanded the Ship’s Store, and I’ve included some pictures of the store at the end of this report so you can see the extensive supplies we currently carry…we have everything you need for a successful inshore, offshore or scalloping trip. We look forward to having you visit us during this coming year…we know you won’t be disappointed. December fishing was, as it always is, very weather dependent. For much of the month, the river has been providing lots of action. 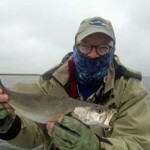 This year has seen more sand trout (also known as silver trout) that I have seen in many years, along with some fine specks. Capt. Tommy Thompson holds one of the nice river sand trout in the picture below, while Sea Hag future guides Elliot McDavid and Chase Norwood show a full board of sea trout captured in the river. Near the end of the month Chase and Elliot have been scoring specks over 21” by trolling 52M Mirrolures, criss-crossing the channel. When the water warmed slightly, trout moved back out onto structure. 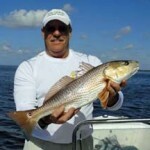 I found this 5 pounder, and Sea Hag regular Randy Coutorier found this excellent redfish south of the river. 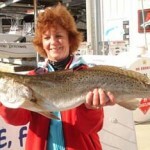 However, Sheila Rees caught the monster trout of the year (and actually going back a number of years) with this 30 inch, 7.5 pound speck caught in one of the creeks near the river. Offshore, the fishing was excellent when the weather allowed offshore trips. There were some excellent red grouper and amberjack taken, and tons of Florida snapper and black sea bass provided excellent table fare. Fishing forecast for January: Offshore, red grouper are still open in January in deep water, so look for those bluebird days after fronts pass through, and plan on stopping in shallower 30 foot water with hard bottom for sea bass and Florida snapper. 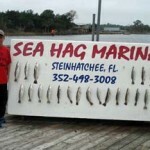 Fishing cut bait or live pinfish will work much better than trolling this time of year. 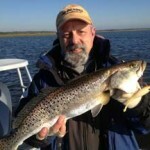 Inshore, those cold fronts will fill the river with trout. Call the marina to get a report before coming, but with plunging temps it’s a great bet that you can get lots of keeper trout without venturing outside. By and large, the most productive river fishing takes place around the bend in front of Gulf Breeze, between marker 26 and the mouth of the river, but with colder temperatures the fish will migrate upriver, sometimes for several miles. Recently fishing has been excellent in front of Roy’s Restaurant and some fine trout have even been caught off the Sea Hag dock at marker 42. The “suicide hole”, just west of the marina and in front of the Estuary, is also a great place to fish deep on the colder days. You’ll see lots of boats; watch to see if people are catching fish. Drifting live shrimp with split shot is a great way to land lots of fish. Cast against the current and let the shrimp drift downward, or use a fish-finder rig with an appropriate sized weight to fish the bottom, but expect to get hung on the rocky river bottom intermittently. We almost always fish 52M Mirrolures, casted upcurrent and worked slowly back to the boat. Although it’s tempting, do NOT anchor in the channel, but take some time and set your anchor so you are out of the way and can cast into the deeper water. And be courteous; the river gets crowded this time of year, so slow down and be friendly to those fishing near you. 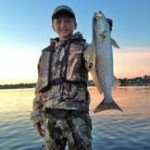 Fishing the river is great fun for kids, so dress them warmly and enjoy the day on the water. And looming on the horizon is sheepshead season. While they usually don’t start their spawning until February, there are years when they are available much earlier. I’ll have more sheepshead tips next month.